The Skinny: Sci-fi actioner based on the notorious Japanese animation of the same name. The HK version is messy and rather cheesy, but it's also great fun. by Kozo: This Hong Kong sci-fi action movie is an adaptation of the Japanimation feature of the same name. It’s about strange other-dimensional creatures (called “Monsters”) and the human task-force policing their actions. Leon Lai is Lung, a human cop whose feelings toward the monsters are mixed because his partner and friend Ying (Jacky Cheung) happens to be a mixed-blood. Ying is a moody sort, mostly because he's confused about his own heritage and under constant discrimination and distrust from other monster-cops. The plot kicks in when Lung runs across a monster named Gaye (Michelle Reis). The two were once involved, which seems odd, but considering that this is Michelle Reis we're talking about, why wouldn't Lung be involved with a monster? 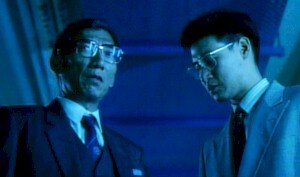 Lung is assigned to investigate a new super-drug called Happiness, which leads him back to Gaye and a sinister plot masterminded by the evil Roy Cheung (who possesses naughty tentacles, if you get my meaning).